CLICK HERE FOR MORE PHOTOS FROM SHEPPS SPEEDWAY’S UMP DIRTcar SUMMER NATIONALS! 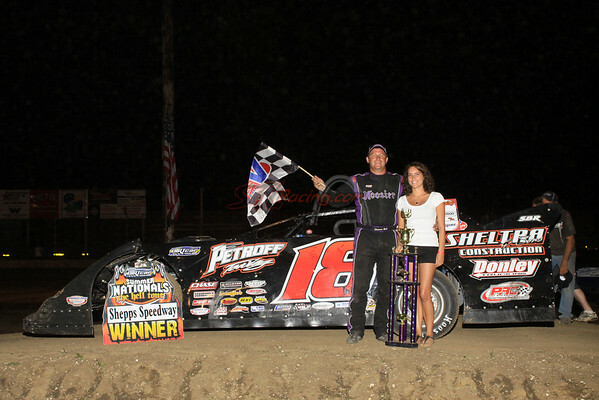 Alexander, IL – June 24, 2010 – Race fans saw a familiar face grace victory lane Thursday night at Shepp’s Speedway during Night 9 of the DIRTcar Summer Nationals. Repeating his performance from the 2009 version of the Hell Tour’s visit to Shepp’s, Shannon Babb of Moweaqua, Ill., used the low side of the tiny quarter-mile oval to sneak past Chatham, Ill., driver Brian Shirley on lap five and lead the remainder of the 40 lap feature to claim the $5,000 winner’s check. Billy Moyer Jr. of Batesville, Ark., started ninth but worked his way to second, and pulled to the rear decklid of Babb, only to settle for the runner-up position. Jeep Van Wormer of Pinconning, Mich., climbed two positions from fifth to finish in the top three while Rodney Melvin of Benton, Ill., and Tim Lance of Brimfield, Ill., rounded out the top five.